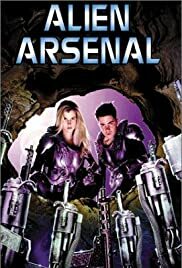 A typical teen powertrip fantasy where nerdy highschooler and his tomboy friend stumble upon alien weaponry in the school basement. They go about dispensing temperate justice for wrongs committed by the school jocks and preppies. Meanwhile, aliens, disguised as students, try to reclaim the armor and zapguns. In order to approximate cutting-edge filmmaking, the camera slowly rocks from side to side. I'm surprised i didn't vomit from seasickness! Standard stuff from Full Moon pictures. Danielle Hoover as Baxter the tomboy is about the only character with her head on straight and is the only shining light in this tepid little tale.